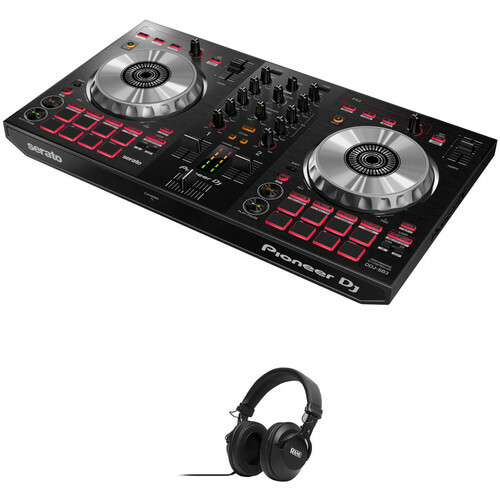 This B&H Kit pairs the Pioneer DJ DDJ-SB3 Portable 2-Channel Serato DJ Lite Controller with a pair of professional DJ headphones to create a complete digital DJ system well suited for beginners and mobile DJs. Designed to work directly with Serato DJ Lite software, the Pioneer DDJ-SB3 Serato DJ Controller provides 2 channels of DJ performance control and builds upon the success of the SB2 controller by adding advanced features such as Pad Scratch and FX Fade. The Pad Scratch is engaged via the performance pads and offers eight distinct scratch techniques recorded by DJ Jazzy Jeff. Any track playing or cued will be scratched. What's more is that the scratch speed is automatically matched to the tracks BPM. The FX Fade feature allows for smooth mixing between two tracks. The function lowers the volume and applies FX to a track at the same time. There are eight FX patterns to choose from including two of the following types: high-pass filter, low-pass filter, loop playback, and backspin. Additional performance features include Hot Cue, Loop, Auto-Loop, Roll, Beat Jump, Slicer, Transform, and Sampler functions. The large aluminum jog wheels can be Dual Deck enabled at the push of a button, allowing two tracks to be controlled, scratched, and hot-cued simultaneously. The center panel of the DDJ-SB3 is a 2-channel mixer with a built-in soundcard, low-jitter clock, and high-performance digital-to-analog converter. Each channel features a trim, a 3-band EQ, a two-way filter, and a level fader. The Pioneer DDJ-SB3 is bus powered and ships with a USB cable. The silver Pioneer HDJ-1500 Professional DJ Headphones deliver the precision audio quality and durability professional DJs depend on. The HDJ-1500's feature 50mm drivers with rare-earth magnets for high output levels. To keep DJs monitoring accurately in their noisy line of work, the HDJ-1500 headphones feature enhanced isolation from outside sounds. HDJ-1500 headphones are built for comfort and longevity with magnesium alloy joints at the earcups, allowing for swivel, rotation, and dependable single-ear monitoring. The cable itself is detachable and easily replaced in the rare event of a short or break. The headphones include a carrying pouch and a 1/4" adapter. Box Dimensions (LxWxH) 23.0 x 13.0 x 5.0"
Box Dimensions (LxWxH) 9.4 x 9.2 x 3.1"